Irish Prime Minister Leo Varadkar "should know better" than to "play around" with Northern Ireland over Brexit, the leader of the Democratic Unionist Party says. Arlene Foster accused Mr Varadkar of being "reckless" as Brexit talks enter a "critical phase". She was speaking after meeting Theresa May at Downing Street. The Irish government says any hard border with Northern Ireland should be off the table. And an EU paper recently suggested Northern Ireland would have to continue to follow many EU rules after Brexit if a hard border was to be avoided. It hinted Northern Ireland may need to stay in the EU customs union if there were to be no checks at the border. That is something which the UK Conservative government - which is supported in key votes by the DUP at Westminster - have said they cannot accept as it would effectively create a border between Northern Ireland and the rest of the UK. While there are genuine and sincerely held logistical and understandable concerns about what happens to the Irish border after Brexit, there is a sense building that perhaps the Irish government is playing those concerns rather harder than is justified. DUP leader Arlene Foster, using rather strong language, told off the Irish leader Leo Varadkar for doing just that today. But the next step in what many would say is a conspiracy theory, borne out of Brexiteer desperation, is to ponder whether the EU as a whole is over-egging their true level of worry about what happens to the border. Brexit and the Irish border: Is all as it seems? Speaking to BBC political editor Laura Kuenssberg, Mrs Foster said: "Some people are taking their moment in the sun, to try and get the maximum in relation to the negotiations - and I understand that but you shouldn't play about with Northern Ireland particularly at a time when we're trying to bring about devolved government again." She said that suggesting leaving the EU would jeopardise the peace process was "a very careless thing to say", particularly with no devolved administration in place, and accused Ireland's government of being "reckless". Mrs Foster said she recognised Brexit was a "big shock" for the Republic of Ireland - "and they are trying to process all of that". "But they certainly shouldn't be using Northern Ireland to get the maximum deal for their citizens." 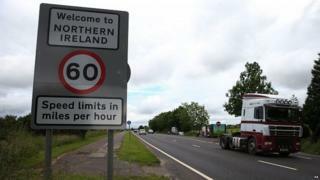 Northern Ireland is the only part of the UK that will share a land border with an EU state post-Brexit, and what happens to the border is one of the key subjects being debated between the EU and the UK. Key to this is how to avoid customs checks on the border when the UK leaves the EU's customs union - the arrangement that allows goods to flow freely between member states. Negotiations have yet to make a breakthrough so the EU says talks on future matters like trade and customs cannot begin yet. But Mrs Foster said it was crucial to move on to the second phase now because the trade arrangement is linked to the border situation. 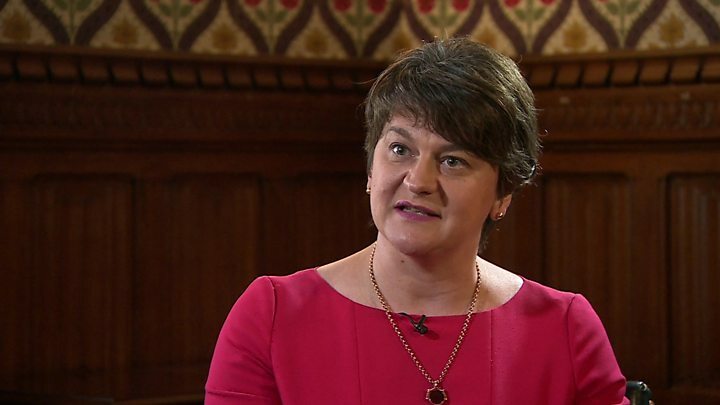 The DUP pledged in June to support Theresa May's minority government over Brexit and other core issues as part of a parliamentary pact due to last at least two years. But Nigel Dodds, the party's deputy leader, has warned that any prospect of the border moving to the Irish Sea after Brexit - an idea suggested by some within the Irish government - would be "gravely destabilising" to the UK government. "They (the Conservatives) know that," he told the BBC's Daily Politics. Given Northern Ireland's trade links with the rest of the UK, he said such a move would be "madness economically, never mind the political consequences". "This is a much bigger issue than trade," he told the Evening Standard. "This is about division on the island of Ireland." Arguing Dublin had the support of the other 26 EU members, he added. "I will not be an Irish foreign minister that presides over a negotiation which is not prioritising peace on the island of Ireland."